From now on, you can enjoy a more convenient and enjoyable points redemption experience through Citi Pay with Points! Earn up to 40X Points by spending with your credit card or Points! Spend and redeem to earn up to 40X Reward Points. From now till May 31, 2019, make selected transactions in the following categories: foreign currency, local online and /or Citi Pay with Points with designated credit cards to enjoy up to 40X Reward Points. Not only can you enjoy Extra Points when you spend, you can also earn Extra Points when you redeem your Points to offset your transaction. Act now to reward yourself with double enjoyment! The Promotion is from March 1 – May 31, 2019. Only the first 20,000 successfully registered Cardholders are eligible for this offer. Registration with a Supplementary Card is not eligible. This Promotion cannot be enjoyed in conjunction with "Earn up to HK$1,200 rebate on shopping abroad and online" Spending Promotion. 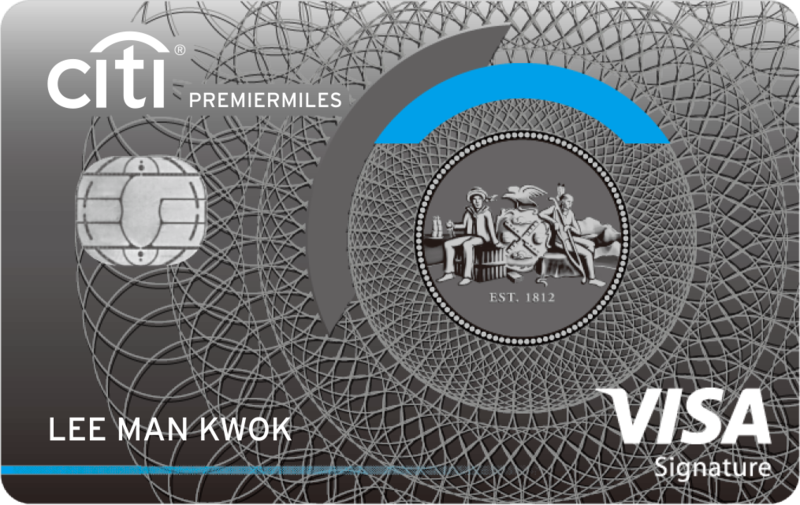 Regardless of the number of Eligible Card(s) registered under the same Cardholder, the latest registered Eligible Card of either "Earn up to 40X points by spending with your credit card and redeeming Points" or "Earn up to HK$1,200 rebate on shopping abroad and online" will prevail and only the transaction(s) made on it will be considered. Eligible Transactions must be made during the Promotion Period. All Eligible Transactions made through Principal and Supplementary cards under the same Eligible Card Account will be combined. Cardholder can choose to participate in "Offer 1" and/or "Offer 2". To be eligible for "Offer 3", customer must need to be eligible for Offer 1 and/or Offer 2. 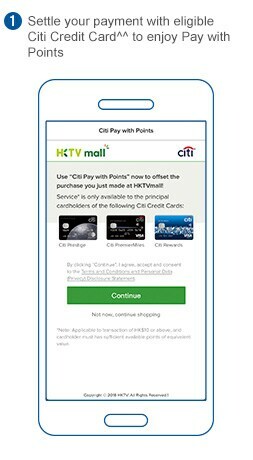 Each Customer (based on the unique Hong Kong Identity Card/ Passport number per Citibank's record) can enjoy a maximum of 48,000 Extra Reward Points per phase in "Offer 1", a maximum of 120,000 Extra Reward Points per phase in "Offer 2" and a maximum of 15,600 Extra Reward Points per phase in "Offer 3". During the entire Promotion Period, each Customer can earn a maximum of 430,800 Extra Rewards Points once only (inclusive of "Offer 1", "Offer2" and "Offer 3"). The Extra Reward Points ("Offer 3") to be rewarded will be based on the total redemption value (in Hong Kong Dollar amount) of the Service during per phase, multiplied by 26 times to determine the amount of Extra Reward Points awarded. Citi Rewards China UnionPay Card is not eligible to participate in Offer 3. You will be prompted to offset your transactions made at participating merchant's online platform with Citi Pay with Points seamlessly without ever leaving the platform. Pay with your points in 3 simple steps! The screens and figures above are for reference only. What is the Citi Pay with Points Service at Merchant Online Platforms? It is a new service that allows you to redeem your Points to offset your eligible transactions at participating merchants' websites/mobile applications. It is applicable to principal credit cardholders of Citi Ultima Card, Citi Prestige Card, Citi PremierMiles Card, Citi Rewards Card, Citi Gold Card and Citi Classic Card issued by Citibank (Hong Kong) Limited ("Eligible Cards"). What are the available Merchant Online Platforms? How does Citi Pay with Points Service at Merchant Online Platforms work? 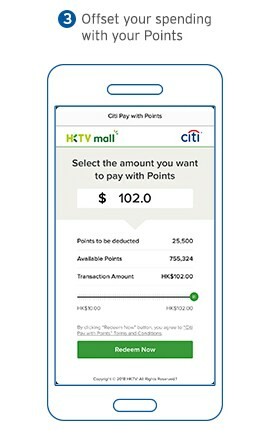 When an eligible cardholder has made a successful transaction of HK$10 or more at the online platform of HKTVmall, or HK$50 or more at the online platform of EGL Tours, Emperor Cinemas, Fortress, PARKnSHOP Online Supermarket and Watsons, he or she can use Citi Pay with Points immediately after the payment is completed. The cardholder inputs their mobile number registered with Citi; Note: to enjoy the service at the online platforms EGL Tours and Emperor Cinemas, the last 4 digits of the cardholder’s eligible card are also required. The cardholder inputs the OTP for authentication. After enrollment, the cardholder can select the amount to pay with Points, starting from the minimum amount and up to the transaction amount (subject to the cardholder's available Points balance), and click "Redeem Now". The cardholder receives an instant confirmation for successful redemption. A cash rebate will be credited to the principal card account within 7 calendar days. The redemption will be shown in the principal cardholder's next statement cycle. What is the redemption ratio for Citi Pay with Points Service at Merchant Online Platforms? The redemption rate varies by credit card types and may change from time to time. The exact redemption amount and points required are based on the display at the Citi Pay with Points page under the participating merchants' online platforms at the time of redemption. Are there charges for using Citi Pay with Points Service at Merchant Online Platforms? No, there is no additional charge. Do I have to use the Citi Pay with Points redemption service at Merchant Online Platforms immediately after my transaction? Yes, the cardholder needs to redeem Citi Pay with Points immediately after the transaction, following the above instructions. The cardholder cannot retrieve the Citi Pay with Points once he/she leaves the enrollment/redemption process. Upon confirmation of a successful redemption, it will show in your account as a statement credit in your next statement cycle. I have multiple Eligible Cards, do I need to enroll each one of them to use the Citi Pay with Points Service at each participating merchant online platform? If the cardholder wants to use the Citi Pay with Points Service for multiple Eligible Cards, each credit card needs to be enrolled in Citi Pay with Points at each participating merchant's online platform. The enrollment will become available when the cardholder uses the Eligible Card to pay for eligible transactions at the participating merchants' online platforms. Can the Citi Customer Service make the Points redemptions for me? No, please follow the instructions to enroll and select the redemption amount at the Citi Pay with Points redemption page at the participating merchants’ online platforms. 1. Citi Pay with Points is only applicable to Principal Cardholders of selected Citi Credit Cards. 2. The redemption rate varies by credit card types, merchants and merchant categories, and may change from time to time. The exact redemption amount and Points required are based on the display at the Citi Pay with Points page at the time of redemption. You will receive an SMS prompting you to settle transactions made at any local merchants with your Points, then it takes just 3 clicks to complete Points redemption via your mobile. 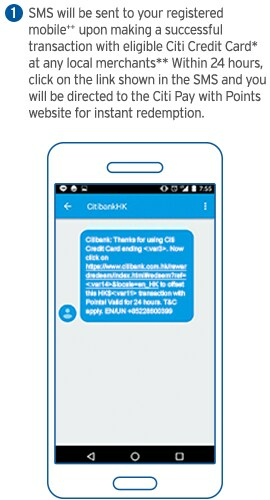 Citi Pay with Points - SMS Redemption Service? It is a new service that allows you to redeem your Points to offset your eligible transactions at designated merchants or in a designated merchant category. It is applicable to principal credit cardholders of Citi Ultima Card, Citi Prestige Card, Citi PremierMiles Card, Citi Rewards Card (except Citi Rewards UnionPay Card), Citi Gold Card and Citi Classic Card issued by Citibank (Hong Kong) Limited. How does Pay with Points - SMS Redemption Service work? When an eligible transaction is made, you will receive an SMS informing you of the transaction amount with a link to the redemption site. By clicking the link to the redemption site, you will be able to select the amount you'd like to redeem with Points and be shown the equivalent Points to be deducted, your available Rewards Points and the transaction amount. Once the redemption amount is selected, click the "Redeem Now" button and you will receive an instant redemption confirmation on the redemption site. What is the Pay with Points - SMS Redemption Service redemption rate? The redemption rate varies by credit card types, merchants and merchant categories, and may change from time to time. The exact redemption amount and points required are based on the display at the Citi Pay with Points website found through the SMS link at the time of redemption. Are there any charges for using Pay with Points - SMS Redemption Service? There are no charges for using Pay with Points. Do I have to use Pay with Points to redeem immediately after receiving the SMS? The Pay with Points redemption service link in the SMS is valid for 24 hours from conducting an eligible transaction. You are advised to redeem upon receiving the SMS to avoid expiry. How long is the redemption service valid? The Pay with Points redemption service is valid for 24 hours from performing the eligible transaction. Upon confirmation of successful redemption, the redemption will be shown in your account as a statement credit in your next statement cycle. Can the Citi Customer Service redeem for me? No, please click the link in the SMS and select the redemption amount at the redemption site. Why didn't I receive the SMS offer while my friend received it? If you have not already opted in to receive direct marketing information via SMS from the bank, then please fill in and submit the opt-in form. I received 2 Pay with Points SMS offers. What should I do? If the offers are still valid and your Points balance is sufficient, you can still click through the links and select the transaction amount you would like to redeem with Points. At which merchants or in which merchant categories can I use Pay with Points - SMS Redemption Service? Pay with Points is applicable to the card transactions at any local merchants** made by eligible principal cardholders. According to your registered mobile number in the bank's records. Except Citi Rewards UnionPay Card. The offer is only applicable to designated Citi Credit Cardholders who received the SMS. Please refer to Terms and Conditions for more details. Refers to retail and online transactions settled in Hong Kong Dollars. The redemption starts from the minimum amount (subject to the minimum Points shown in the Pay with Points website) and up to the transaction amount (subject to the cardholder's available Points balance). A cash rebate will be credited to the principal card account of the designated card within 7 calendar days. The redemption will be shown in the principal cardholder's next statement cycle. You can offset your Credit Card recent designated transactions with Points online. Check your eligible Credit Card account for eligible purchases. Make your selection - be sure your Points balance is enough to cover the total charge. Accept the Pay with Points Terms and Conditions and a statement credit will be posed to your credit card account. * Don't have a Citibank Online User ID and password? Register here. Enjoy more fabulous offers with Citi ThankYouSM Rewards! Unless otherwise specified, the Pay with Points on Merchants' Online Platforms Service (the "Service") applies to Principal Cardholders ("Cardholders") of Citi Ultima Card, Citi Prestige Card, Citi PremierMiles Card, Citi Rewards Card, Citi Gold Card and Citi Classic Card issued by Citibank (Hong Kong) Limited ("Citibank") ("Eligible Cards"). Citi Rewards UnionPay Card is not applicable to Online Platforms (as defined in Clause 2) of Fortress, HKTVmall, PARKnSHOP Online Supermarket and Watsons. Unless otherwise specified, this Service is applicable to the Single Net Transaction (as defined in Clause 3) Eligible Cardholders made at the official website and/or mobile application (if available) ("Online Platforms", individually referred to as "Online Platform") of EGL Tours, Emperor Cinemas, Fortress, HKTVmall, PARKnSHOP Online Supermarket and Watsons ("Merchants", individually referred to as "Merchant") with an Eligible Card ("Eligible Transaction"). A "Single Net Transaction" applies to the final amount of a single transaction after deduction of all applicable discounts, reductions and value of cash vouchers. Unposted/ cancelled/ refunded/ falsified/ unauthorized transactions are excluded. 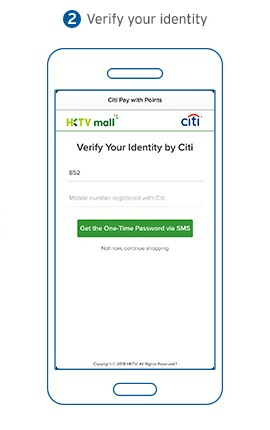 Unless otherwise specified, to enjoy this Service on Merchants' Online Platforms, Eligible Cardholders must verify their identity by providing their mobile phone number that has been registered with Citibank, as per Citibank's last updated record, to receive a One-Time Password, and the identity verification will be confirmed upon the One-Time Password is correctly entered. Eligible Cardholders can select the amount to redeem with Citi Points ("Points") and complete the redemption under the Service. Identity verification will not be required for subsequent redemptions made by the same Eligible Card under the same Cardholder's membership account of the individual Merchant. Clause 4 does not apply to the Online Platforms of EGL Tours and Emperor Cinemas. To enjoy this Service on the Online Platforms of EGL Tours and Emperor Cinemas, Eligible Cardholders must provide the last 4 digits of Eligible Card and their mobile phone number that has been registered with Citibank, as per Citibank's last updated record, to receive a One-Time Password, and the identity verification will be confirmed upon the One-Time Password is correctly entered. Eligible Cardholders can select the amount to redeem with Points and complete the redemption under the Service. If the Eligible Card account provided by the Eligible Cardholder is not a credit card account for effecting the Eligible Transaction, the redemption amount will be posted to the Eligible Card account provided by the Cardholder according to Clause 7 as a statement credit, which can be used for offsetting the purchases other than the Eligible Transaction. Identity verification is required for every redemption made by the Eligible Cardholder. The Service is valid immediately after performing the Eligible Transaction. In any case Eligible Cardholders exit from Merchants' Online Platforms voluntarily or involuntarily including but not limited to network disconnection, technical device malfunction or unexpected outage on Merchants' Online Platforms, during any of the steps illustrated under Clause 4 or Clause 5, Cardholders will not be eligible to enjoy the Service and will require to make another Eligible Transaction at Merchants' Online Platforms to enjoy the Service. The amount of Points redeemed for statement credits to offset Eligible Transaction will be deducted from Eligible Card account. Cardholders may redeem up to Eligible Transaction amount in full with Points or available Points at Eligible Card account (whichever is lower). Cardholders must redeem a minimum amount, which is subject to the minimum required Points shown in the Citi Pay with Points page under Merchants' Online Platforms for each redemption. Statement credits will be posted to Eligible Cardholders' Card Account within 7 calendar days of redemption. The redemption rate varies by credit card types and may change from time to time. The exact redemption amount and points required are based on the display at the Citi Pay with Points page under Merchants' Online Platforms at the time of redemption. Eligible Cardholders must promptly update Citibank of any change to mobile phone number. Citibank shall not be liable to any Cardholders or anyone else for any losses or damages arising from the Service. The Service cannot be cancelled, returned, exchanged or traded for cash or other promotion. If under any circumstances Eligible Cardholders return or cancel the Eligible Transaction, any associated statement credit will remain on Eligible Cardholders' Card Account and Points will not be returned. Unless otherwise specified, Terms and Conditions of the Citi ThankYouSM Rewards Program apply. For details, please visit https://www.citirewards.com/cms/sites/globalrewards-hk-eng/terms-and-conditions.page. 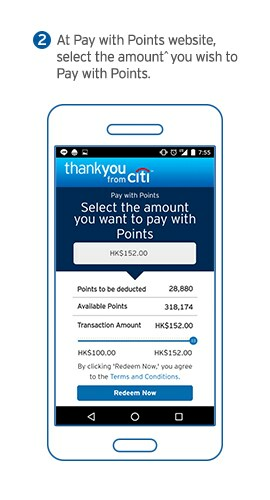 The Pay with Points – SMS Redemption Service (the "Service") is applicable to the principal cardholders ("Cardholders") of Citi Ultima Card, Citi Prestige Card, Citi PremierMiles Card, Citi Rewards Card (except Citi Rewards UnionPay Card), Citi Gold Card and Citi Classic Card issued by Citibank (Hong Kong) Limited ("Citibank") ("Eligible Cards"). This Service is applicable to the card transactions Cardholders made at local merchant or merchant category with Eligible Card and specified in the SMS ("Selected Transaction"). Local merchant categories are subject to the definition of Visa/MasterCard International's Merchant Data Standards and the settings of the acquiring bank. Ineligible transactions include but are not limited to withdrawal amount/loan amount under the Balance Transfer Program, Cash Conversion Program, Flexi-Installment Program, Quick Cash payment to the Inland Revenue Department, casino transactions, other unauthorized transactions and fraud and abuse transactions. To enjoy this Service, Eligible Cardholders must click the link provided in the SMS via their mobile phone number that has been registered with Citibank, as per Citibank's last updated records, and select the amount to redeem with Citi ThankYouSM Rewards Points ("Points"). Cardholders must redeem using the Points on the Eligible Card specified in the SMS. The Service is subject to the Eligible Cardholder's mobile phone service provider ability to support the service, and the relevant terms and charges of such service provider. The Service is valid within 24 hours of performing the Selected Transaction. The amount of Points redeemed for statement credits to offset Selected Transaction will be deducted from Eligible Card account ("Redemption"). Cardholders may redeem up to Selected Transaction amount in full with Points or available Points at Eligible Card account (whichever is lower). Cardholders must redeem a minimum amount, which is subject to the minimum required Points shown in the Citi Pay with Points website for each redemption. Statement credits will be posted to Eligible Cardholder's Card Account within 7 calendar days of redemption. Citibank guarantees neither the delivery, accuracy, nor security of the contents of any SMS sent by Citibank to Eligible Cardholders. Eligible Cardholders must promptly update Citibank of any change to mobile phone number. Citibank shall not be liable to any Cardholder or anyone else for any losses or damages arising from the Service, including but not limited to, (a) non-delivery, delayed delivery, wrong delivery or partial delivery of any SMS; or (b) inaccurate contents of any SMS. If Eligible Cardholder returns or cancels the Selected Transaction, any associated statement credit will remain on Eligible Cardholder's Card Account and Points will not be returned. Citibank reserves the right to terminate this Service or amend its terms and conditions at any time without prior notice. In the event of any dispute, Citibank's decision shall be final and conclusive. Please review the full Terms & Conditions and check the box at the bottom. The "Pay with Points- Online Redemption Service" (the "Service") is applicable to the principal cardholders ("Cardholders") of Citi Ultima Card, Citi Prestige Card, Citi PremierMiles Card, Citi Rewards Card, Citi Gold Card and Citi Classic Card issued by Citibank (Hong Kong) Limited ("Citibank") ("Eligible Card"). To use the Service, Cardholder must be enrolled to Citibank Online. Cardholder's ThankYouSM Account and Eligible Card Account must be in good standing at the time the Cardholder uses the Service. Only eligible purchases made with Cardholder's Eligible Card Account in the current billing period and unbilled eligible purchases, up to the last 60 days ("Eligible Purchase"), are eligible for "Pay with Points- Online Redemption Service" statement credits ("Statement Credits"). Temporary authorizations are not eligible for the Service. Eligible Purchases exclude, but are not limited to, cash advances, fees and charges, withdrawal/loan amount under the Balance Transfer Program, Cash Conversion Program, Flexi-installment Program, Dial-a-Check Installment Program, payment to the Inland Revenue Department, casino transactions, online bill payment, unposted / cancelled / refunded transactions, other unauthorized transactions and fraud and abuse transactions. Citibank reserves the right to determine which purchases qualify as Eligible Purchases. 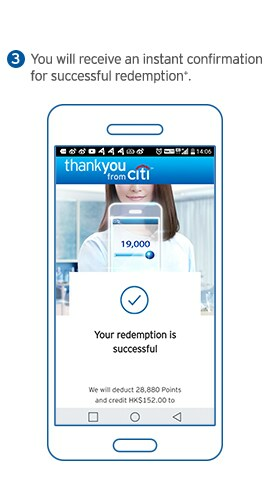 The amount of Citi ThankYouSM Rewards Points ("Points") required for redemption will be deducted from the Eligible Card's available Points balance. Cardholders may redeem Eligible Purchases up to the available Point balance. Statement credits will be posted to the Eligible Card Account within 2 business days of redemption. Statement Credits apply towards the Cardholder's next month's Card Account statement balance, but not the current month's minimum or total payment due. The required minimum and total payment reflected on the current Card Account statement must be paid pursuant to the terms of the Card Agreement. Cardholders are required to use the available Points to redeem the value of an Eligible Purchase in full. Partial redemptions of Eligible Purchase are not allowed. There is no fee to use the Service. Citibank may set minimum and/or maximum Points redemption requirements for the Service at any time. Citibank has the right to change the Points to Hong Kong Dollar conversion rate for Statement Credits at any time. The Statement Credits obtained from "Pay with Points- Online Redemption Service" cannot be cancelled, returned, exchanged or traded for cash or other promotion. If Cardholder returns or cancels the Eligible Purchase, any associated statement credit will remain on Eligible Cardholder's Card Account and Points will not be returned. Citibank reserves the right to terminate the Service or amend its terms and conditions at any time without prior notice. Return the completed form to Citibank branch or mail to Citibank (Hong Kong) Limited - PO Box 20151 Hennessy Road Post Office HK.